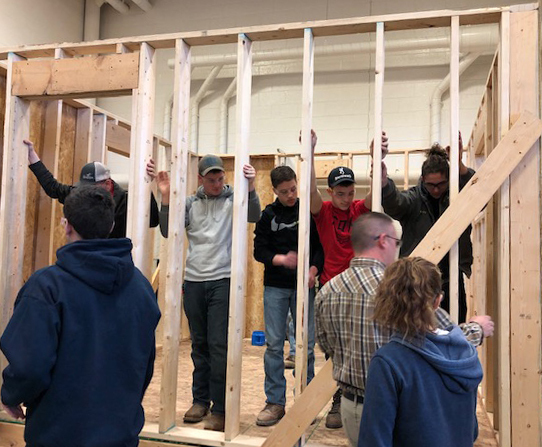 The Building Construction Program provides students with an exciting career that will teach entry-level job skills for the construction industry. Tool and job-site safety in compliance with OSHA standards are stressed. Instruction is provided in carpentry, masonry, plumbing, heating, electrical, and painting/decorating. Skills such as cost estimating, cutting, fitting, fastening, finishing, blueprint reading and following technical specifications are also taught. Students who graduate in good standing will earn industrial credentials that are recognized throughout the United States, as well as OSHA 10-hour or 30-hour training credentials. Careers as Carpenters, Masons, Electricians, and Plumbers are possible. Employment in manufacturing plants where building units, components or building materials are produced or sold also provide opportunities to graduates. Others become self-employed or begin careers as industrial maintenance technicians. A number of colleges have Bachelor Degree programs for Construction Managers and other related fields. BCTC maintains both dual enrollment and articulations agreements with Allegany College of Maryland where students earn college credits while attending BCTC, as well as other articulation agreements across the state.